We didn’t partake of any Super Bowl festivities, and in retrospect, we’re glad we didn’t, because it didn’t turn out to be much of a game. Nonetheless, we wanted something to enjoy with the commercials, so we tried this recipe from Giada De Laurentiis. The recipe proved to be much better than the game. We plan to make this dish again; the unique combination of spices alongside diced poblano peppers was especially appealing. 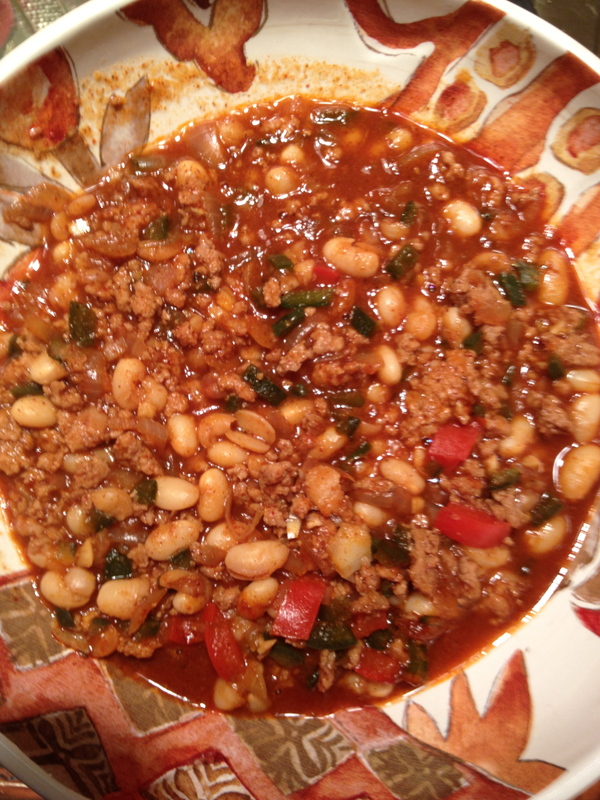 And Giada was right–the chili was even better the next day! We found this recipe in a newspaper supplement, but the online link is here. Ms. De Laurentiis includes the recipe in her new cookbook, Giada’s Feel Good Food. In case you can’t find the recipe in either source, we include the important details here. In the dish shown in the picture below, we substituted diced red bell pepper for the celery. Additionally, when we prepare dishes like this one, we prefer to sauté the meat first, then set it aside while we sauté the vegetables in the pan with a small amount of the oils left from cooking the meat. One other note: Giada writes that this recipe uses chili powder, not chile powder. The difference is that chili powder is a blend of spices (not too hot), while chile powder is usually ground dried chilies (often cayenne, and quite hot). Unless you just want heat and not much flavor, we also recommend “chili” powder that is not too hot! Heat oil over medium-high heat in a large, heavy pot or Dutch oven. Add poblanos, onion. celery, and garlic. Sauté until vegetables soften, 5 to 6 minutes. Add turkey and sauté, breaking up the meat with back of a spoon, until no longer pink, about 7 minutes. Sprinkle flour over meat and stir to blend. Add tomato paste, chili powder, cumin, oregano, cinnamon, cloves, brown sugar, 1 tsp salt, and 1/2 tsp pepper. Cook, stirring, 1-2 minutes. Add broth and beans. Bring to a simmer. Reduce heat to medium-low and simmer, stirring often, until flavors blend and chili thickens, 20 to 30 minutes. Spoon chili into bowls and serve. This entry was posted in Turkey and tagged brown sugar, cannellini beans, celery, chicken stock, chili powder, cinnamon, cloves, cumin, flour, garlic, ground turkey, main dish, olive oil, onion, oregano, poblano pepper, tomato paste. Bookmark the permalink.